Back to the ICU… Ugh. Went to work earlier than normal today to try and get caught up a little. Got a call around 11:30 saying that Annabelle had taken a turn for the worse, wasn’t breathing well, and they were headed back down to the ICU. Her lactates were elevated (6.1… should be around 1) and she was severely desatting even on high oxygen. They’ve given her fluid to bring her lactates down… but her lungs are wet which contributes to her desatting… so they also want to get fluid OFF of her. Go figure. WE ARE OFFICIALLY ON THE TRANSPLANT LIST! Effective yesterday afternoon, we were put on the list, with a status of 1b. We are now 1a, the highest level. I’m excited at the same time as I’m nervous as all get out. Excited because our “new” journey has begun… and we can’t get through the journey if you never start it. It’s like when you get in the car, knowing that you are starting on a long trip. You know the hours will be long, kids will be cranky, sleep will be questionable, and you will eat WAY too much chocolate and junk food… but there is a destination, and our prayer is that the destination is a new heart for Annabelle and our being able to finally bring her HOME. On the flip side, it’s scary because we have no idea how long the journey will be, the ending we want is not guarenteed, and as i told the nurses… instead of counting DOWN the time … we are counting UP the time. So, today is day 2. I think I’ll add a counter to the side of my blog:-) I wonder if they have a “count up” one! But for today, please pray that Annabelle’s sats stabilize and that she can calm down. She’s still pretty grumpy and just not feeling well. Although while I’ve been typing this… she feel asleep, so is finally calm! I am so happy to read Annabelle is on the transplant list. I almost jumped for joy when I read it. Lots of prayers headed your way!! I found your blog on Bowen's Heart and have been following Annabelle's condition for a couple months. I'm glad to hear she's on the transplant list and that now she is a top priority! Praying she gets a heart soon and feels better in the meantime! Blessings to you! I still think about you all the time. I'm praying for your little girl. Miss "writing time" with you. And I imagine someday you will have so much to write about and help others by sharing your story. Your family is in my prayers! "And even if all those things were taken from me tomorrow… I would still have God. I know it is true but I the same time I know that it must be difficult to think about the whole truth of it. It makes me think of Job. You must feel like Job at times to some degree. I don't mean this to be discouraging; in fact, just the opposite. I admire your faith on our God. May he keep you strong as you wait on Him and His timing. We continue to pray for precious Annabelle. I'm sorry to hear that she is in the ICU but like you already pointed out, at least that moves her up on the list. God bless! We know how hard this all is! Just started following your blog about three weeks ago from Bowen's Heart. As I woke this morning I prayed for little Annabelle and your family, The Lord is gently holding all of you especially Annabelle's little heart current and future. God Bless. Praying for you and sweet Annabelle, Krista. May God be your strength and light. 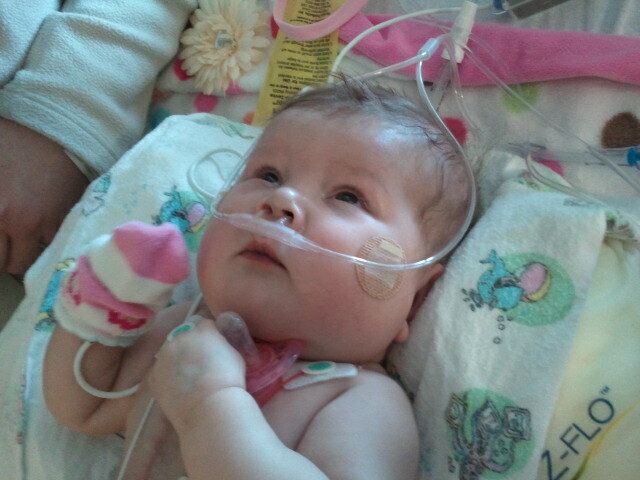 praying she gets a heart soon. and sorry she is in the ICU again.